In an attempt to help bloggers track down content theft and copyright violations, MaxPower.ca has created the Digital Fingerprint Detecting Content Theft WordPress Plugin for full version WordPress blogs. The plugin injects a “digital fingerprint” manually into your posts which is seen only in your feeds, not in the post itself. Install and activate the Digital Fingerprint Detecting Content Theft WordPress Plugin as you would any other WordPress Plugin. It adds a tabbed panel to your Manage panel. The first time you access it, an error will be reported at the top reminding you that you haven’t created your unique digital fingerprint. Scroll down to the bottom of the screen and enter some unique text into the digital fingerprint section. The Digital Fingerprint Detecting WordPress Plugin works by adding unique content to your feeds. 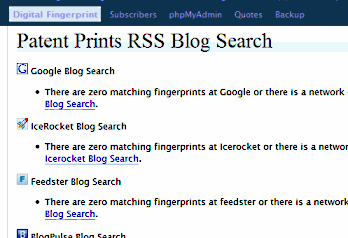 If your feed content shows up on any blog that is patrolled by Google BlogSearch, Feedster, IceRocket, BlogPulse, Sphere, Google, Yahoo!, and MSN, the Plugin searches for the unique phrase and displays search results with that phrase in the Digital Fingerprint panel. Unlike a barcode or some assigned number, the digital fingerprint you set in the Plugin is a combination of words, letters, and/or numbers that doesn’t quite look like “normal” searchable text. Maxpower explains the digital fingerprint in “Choosing a Digital Fingerprint That is Right For Me”. Since the text will appear in your feed, what should it be? It needs to be unique, distinctive from other phrases people are likely to use in their blogs, while not looking too strange. Come up with something unique that when searched, would only result in your blog being found and enter it in the digital fingerprint form and update the settings. While I wish every post going out from my site would automatically have this unique digital fingerprint inserted just before the post text, you have to manually add it to your posts. This means past posts have to be edited to add the digital fingerprint as well as adding it to new posts as you blog. Put your cursor at the end of a sentence or paragraph in the top section of your post content, in place that makes sense if someone is reading the feed, but close enough to the top to be picked up by search engines which may only scan the top third of your web page content into its database. Click on the fingerprint button and the comment code will be inserted. Save the post and test this by viewing the post on your blog. You should see nothing in the spot where you inserted the digital fingerprint code. In a week or more, check in with the Digital Fingerprint panel to see if your post content shows up where it shouldn’t be. If you find a bunch of unrelated posts showing up with your “unique” phrase, it’s obviously not unique enough. You may be lucky and never see your writing illegally published, but with the recent scam of bitacle.org, the likelihood of your blog’s content getting scrapped through its feeds increases. This is not a fool proof method of stopping content scrappers, plagiarists, and content thieves, but it does help your blog post pop up in search results to you can keep track of your posts just in case they do pop up on a search engine or directory. One of the neat options the Plugin features is the ability to add your digital fingerprint to Google Alerts, so Google will automatically send you an email whenever your digital fingerprint phrase shows up in their search engine results. You can do this manually without a WordPress Plugin. Just type in some unique phrase consistently into your post content that doesn’t interfere with your readers’ reading, then search various search engines and/or Copyscape once in awhile to see if your posts show up in other blogs. You could use the popular Angsuman’s Feed Copyrighter WordPress Plugin to automatically add a copyright message of your own design to your feeds from your WordPress blog, or the Better Feed WordPress Plugin by FrenchFragFactory allows you to add text and other elements to your feeds. While fairly easy to add unique text to your feeds, it’s much harder and more time consuming to search through all the various search engines, directories, and blog search services to find your unique phrase. The Digital Fingerprint Detecting Content Theft WordPress Plugin makes the process much faster and easier. I’ll be talking about some other copyright protection efforts you can take to protect your blog content soon, so stay tuned. This entry was written by Lorelle VanFossen and posted on September 30, 2006 at 2:16 am and filed under blogging tips, Web Wise, WordPress, WordPress News, WordPress Tips with tags how to use wordpress, wordpress, wordpress help, WordPress News, WordPress Tips, wordpress tutorials. Bookmark the permalink. Follow any comments here with the RSS feed for this post. Post a comment or leave a trackback: Trackback URL. This technology is… not new. Of course not. Did I say it was? The Plugin, however, is, and it does make it easier and faster to monitor the various search engines and directories. I’ve been using this same technique manually for years, as described at the end of the article. This process speeds things up wonderfully. Sorry Lorelle, I have to teach myself not to comment when I’ve had a few to drink. This plugin is very useful, and I’ve passed it on to a few people. how to deal with the content theft found? Thanks for the feedback regarding the plugin. I’ll try and add the option to automaticly insert the fingerprint in every post you publish for the next version. The tricky part would be determining where it should be inserted everytime (start, middle, end, after first paragraph?). Another brand new anti-splog plugin for wordpress also deserves mentioning, Antileech by Owen Winkler. It serves up fake content to splogs when they come to ‘borrow’ your content. Its the first plugin that I am aware of that actually fights back against plagiarism and splogs. As if the site address is part of the result in the feed. I rewrote my “digital fingerprint” to then say something like […report illegal use to ] thinking it would then produce: […report illegal use to -site:www.expample.com]. It didn’t. That’s confusing. Also, a good Google Alert search that “prevents” you getting alerted…I think you don’t want the word “prevent” in there, do you? You might want to fix those minor details on the panel. I’m thrilled with Owen’s Plugin. I’m going to promote it heavily as soon as I get an answer to a question I asked him about it. Bitacle has proven more difficult to thwart than originally thought as they are changing their IP and playing games to still try to grab content. As soon as I get a little more info, the world will hear plenty about that plugin from here. Thanks! I answered your questions via email. Pony up. I love the idea and plug-in, but will never remember to add the code to each post (or want to go back and add it to old posts). What about adding the necessary code to a plug-in that automatically adds code to each post such as the HitTail Plugin? I don’t understand. It adds the “code” automatically. Any post grabbed through feeds gets the “code” injected into the feed. If they are getting your content otherwise, like manual copy and paste, this Plugin won’t work. One way that you can find where or how your content is being used online is to type one or 2 of your unique phrases “in quotes” into google and see what comes up. If you find other sites that are indexed with your content – content them and say “NO NO”! If your content doesn’t show up – it means that it’s not indexed in Google and won’t be found (or read) by anyone via Google anyway. Well, not exactly. I explained this technique in What Do You Do When Someone Steals Your Content and Finding Stolen Content and Copyright Infringements, among other techniques, but just because it’s not indexed in Google doesn’t mean that it isn’t getting found elsewhere. And it does not make copyright violations right. Google isn’t the end all and be all. Hmm, so I’m new to blogging and found your article to be interesting and informtive. I decided to google for one of your fingerprint examples just to see if this site would come up. For some reason, a different site came up instead as the sole search result. It seems to be some kind of a wiki, but it looks like that post was copy/pasted without any mention of you as the original author. Can this work for BLogger? I do not know. I do not work with Blogger. If you’re a WordPress user, you might be interested in this….